Eye Magazine | Blog | Wake up Brazil! 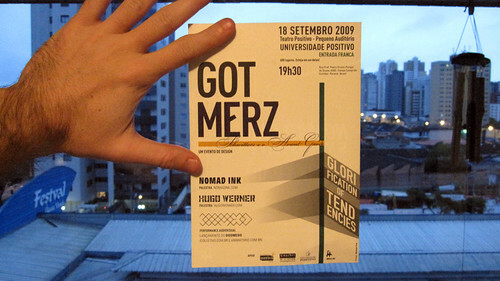 GOT MERZ was an attempt to send a wake up call to Brazil, an attempt to stop people blindly following trends, write Tyler Johnson and Flavia Sanches of Nomad Ink, a design studio in Curitiba, Brazil. 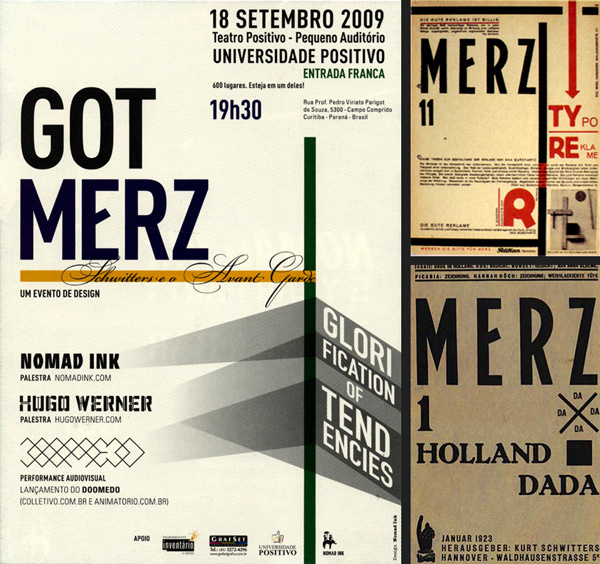 The GOT in GOT MERZ stands for ‘Glorification of Tendencies’, or trends, and MERZ is a tribute to German Dada artist, Kurt Schwitters. 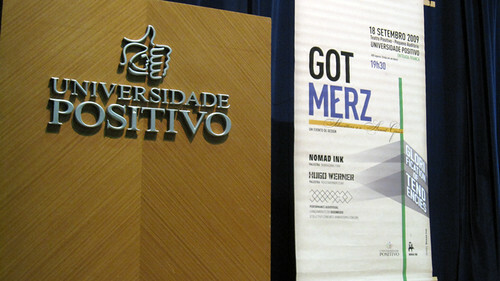 We spoke to five Brazilian designers – from art directors to students – about the event and its themes. 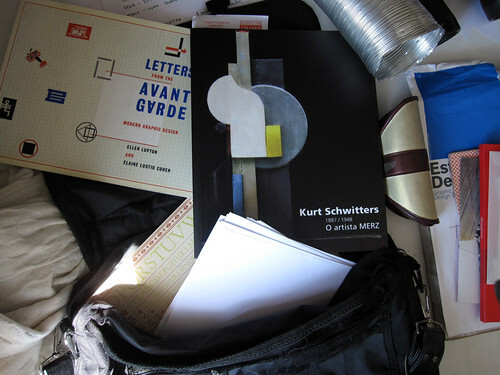 Below: Making of GOT MERZ, Schwitters catalogue and Lupton and Cohen’s book Letters from the Avant Garde. I was born in 1984, and graduated in 2006. What is the ‘glorification of tendencies?’ Essentially, it’s laziness – being too lazy to think, too lazy to produce new things, only following the trends. You don’t always have to make new things, though – it’s up to you. Trends would not exist if everyone were innovating. There would not be movements, if people were not following. Tendencies are therefore important. How is a movement formed? By people coming together. However, some people come afterwards, not necessarily interested in those common ideas. More like ‘jumping on the band wagon,’ creating critical mass, giving projection and energy to what was once an idea. I really like Dali – almost all designers like Dali – but hey, lets talk Surrealism. I’ll never be a Surrealist. I will always be something else, influenced by my vision and my efforts. Except for those who are paid to copy things, every time you search for references, you are creating a Frankenstein. In a certain form, it’s valid. Design has to come from within the human being, from someone who views work as pleasure. I would like it if more designers felt that design was not just a tool, or a fast problem solver. If outside of work, they would continue producing, drawing, collage, photography, filming. Maybe the work is naive, and will never be a tendency. But it will make you a better professional. It’s more innovative than only searching for tendencies and trends in other people’s work. 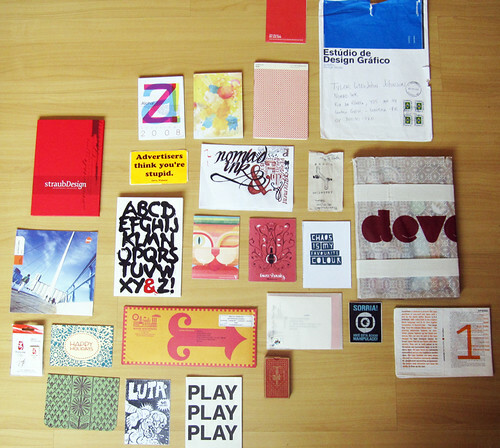 I was born in 1974, and graduated in both Industrial Design (CEFET) and printmaking (EMBAP) in 1986. Designers don’t realise the diverse areas there are to work in. Probably less than half will actually get to work as designers. They must realise that it’s an ample field. There is room not only for creative work, but for work in many areas. This is not said in school. If you compare it with an advertising program, for example–which there is a big demand for–they prepare students for different areas, such as: client relations, media, in addition to art director, film director, etc. The scope is broad. The design schools just teach design-design-design. The field is a broad area, it’s not just making design. Illustration is the hottest thing today. It’s been growing for the past six or seven years. Being an illustrator is cool right now, while before it was the underdog. If we look at advertising – photography used to be the popular choice – but nowadays all you see is illustration. Today, everybody wants to be an illustrator. We find new talent through the Internet, Flickr, Ffffound and so on. We have nineteen designers working here. So we constantly exchange information among ourselves, about good work someone just saw, etc. The Internet’s impressive. There are so many people doing good work. I was born in 1971, in Rancharia, Sao Paulo state, followed by ten years in Maringa, in southern Brazil, and the rest in Curitiba. It was later in life that I realised my connection to art and design, but thinking back, I was born with this interest. I always liked to draw, but only later did I really immerse myself in design and art in general. Design, drawing, and being creative can’t be learned. I think you are born with it. You can improve in school. College can activate a latent talent. But I never had the financial means for college, so I took courses, workshops, and participated in design events–to get involved, and try to be inside the design world, and keep up with design happenings. And not be behind … There are many designers with diplomas, whose work is not that great. There is the label – I don’t consider myself one – but you could call me ‘micreiro1’. In Brazil, there is a negative stereotype of self-taught designers, referred to as ‘micreiros’, (me-krey-ros), much as ‘desktop publishers’ are looked down upon by trained designers in other parts of the world. I was born in 1981 and graduated in 2005. I live in Curitiba. My influences are from everything that I have lived. A little Internet, Curitiba, the World. I went to the USA because I had a visa, and took a one-week workshop in NYC with James Victore, Paul Sahre and Jan Wilker. Before the class, I had a vision about design, which changed afterwards, and the process was painful. One thing that changed for me is the fact that everything must have a concept, which can be shallow, or deep. You also must have aesthetics. Concept and aesthetics function independently from each other. Together, they create the magic formula of design. At the workshop I understood what is perhaps the third element of the concept and aesthetics, which I call: the truth. In my personal opinion, Jan Wilker’s work is not aesthetically appealing, and there is no concept, but it’s full of truth. It’s him. It’s crazy, he is off his rocker, totally outsider work, but it’s him. When he wakes up in the morning, he draws his grumpy mood right there. For example, his first project since arriving in the USA from Germany was to produce a CD package for a band. So he listened to the band’s music, which he hated. On the third day of working on this project, he scrawled the band’s faces, scanned the artwork, and sent it for approval. The art was approved. 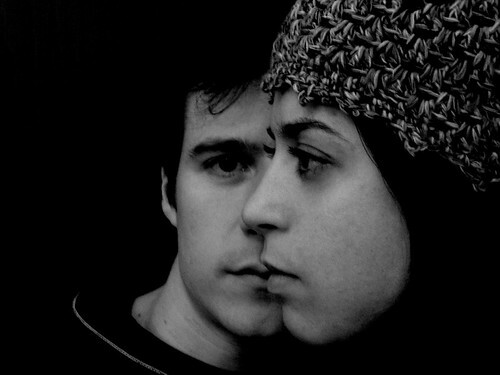 It was a shallow concept, aesthetically whatever, sure, it was aggressively expressed, with the scratched faces. But there’s lots of truth in it. Because it was his bad mood, his frustration towards the music. It became the official graphic material of that band for the CD. James Victore showed me the path to the truth. Of course, we always try to be true to everything in life, but without thinking much about that, perhaps. And Victore made me think about it. He put truth on the same level of importance as the aesthetic and concept. So, design must have aesthetic, concept and truth. Flavia Sanches and Tyler Johnson (below) run Nomad Ink, a ‘cultural and cross-cultural’ design studio based in Curitiba, Brazil. Eye magazine is available from all good design bookshops and at the online Eye shop, where you can order subscriptions, single issues and back issues. The summer issue, Eye 76, out this week, is a music special. You can read a selection of pages on Eye Before You Buy on Issuu.